Dropped my cell phone in the toilet yesterday — after flushing. So it wasn’t THAT bad. I did the first sensible thing you should do — dive in after it. The second sensible thing you should do is pull the battery out. Then bang your head against the stall door for being such a klutzy eejit. Upon exiting the stall, if there are other visitors, by now they’re wondering what the hell was all that splashing and banging about. Just give them a look that says “What are you looking at?” in a Jerri Blank kind of way. I took it all apart back at my desk and using paper towels soaked up what drops of water I could find. Then I stuck the dissembled pieces out in the car in the hot sun for a couple hours. Most sites recommend waiting 3 days to let it completely dry but I was fairly confident that I had retrieved it fast enough and that the mid-May heat was intense enough to do the trick. She’s all right now working like a charm and I just don’t want to think about it anymore. 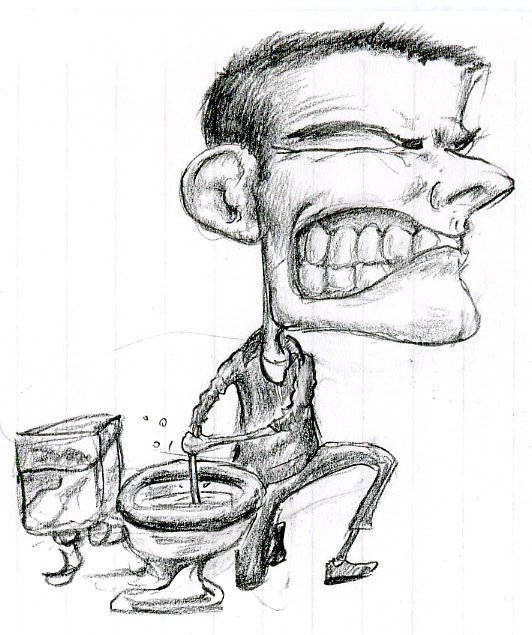 This entry was posted in cellphone, doodles, drawings, mobile, recovery, toilet, water. Bookmark the permalink.